Religious Sisters have vowed their lives to God for centuries. The vast majority of these women have no thoughts about actually giving their lives to God in martyrdom. The same was true of Sister Stella and her Ten Companions, Sisters of the Holy Family of Nazareth who lived in Nowogrodek, Poland. They lived simple, faith-filled, dedicated lives, serving the people of Nowogrodek as God had sent them to do. Never did they think that they would be asked one day to make the ultimate sacrifice to save the families of the town. The story begins on September 4, 1929, when the first two Sisters of the Holy Family of Nazareth arrived in the small town of Nowogrodek. A few people helped them to find a place to live and in time more Sisters joined them. The townspeople were not terribly welcoming to these women of God. In the face of opposition to their presence, there was some talk of withdrawing the Sisters. Bishop Zygmunt Lozinski, who had recruited the Sisters pleaded, “Do not leave Nowogrodek; remain at your post. That is God’s will and mine!” Superior General, Mother Lauretta Lubowidzka was just as forceful in her response. “You must definitely remain at your post. You are not permitted to withdraw from the home of Christ the King. He is to be victorious. We must do battle for the sake of the Kingdom. Fearlessly withstand all the difficulties because great things will take place there.” Perhaps they were prophets…. In obedience, the Sisters stayed and were joined by others. Patiently and with love, these women reached out to the people of Nowogrodek. At first they started with a class to teach needlework to girls. Then, they began teaching religion and tutoring in French. Gradually, the townspeople came to accept and love the Sisters. The Sisters also cared for the local parish church, lovingly referred to as the Fara. At Mass and devotions, the Sisters were always seen kneeling on their prie-dieux. For many years life in Nowogrodek was peaceful. People of different faiths lived side by side with no problems. The Fara became the place where the townspeople gathered in fervent faith and activities. The Sisters’ lives centered on their prayer, care of the church, teaching religion, starting schools for the local children and enjoying their community life. The Second World War changed all of this for everyone. Nowogrodek was occupied first by the Russians and later by the Germans. With the Russian occupation, the school was taken from the Sisters. Their religious habits disappeared. They were forced to leave their convent and live in the homes of parishioners. They were together only for Mass and devotions in the Fara. Within two years the town came under German occupation. The Sisters were encouraged to return to their convent and to go back to wearing their distinctive garb. The Sisters continued doing all kinds of work to provide for their needs. It was a trying time for everyone, but it would get worse. Twelve Sisters resided in the convent in the summer of 1943. The Germans had become more forceful in their treatment of the citizens. Jews were rounded up and killed right in the town. Priests in the area were killed. 120 people, including fathers and other members of Polish families were arrested from July 17 – 19, 1943. The women of the town came to the Sisters and begged them to pray for their release. The Sisters prayed that if a sacrifice was needed, that they be sacrificed and the men be returned to Nowogrodek. On Sunday, August 1, 1943, after spending the night in the basement of the commissariat, Sisters Stella Mardosewicz, Imelda Zak, Kanizja Mackiewicz, Rajmunda Kukolowicz, Daniela Jozwik, Kanuta Chrobot, Sergia Rapiej, Gwidona Cierpka, Felicyta Borowik, Heliodora Matuszewska, and Boromea Narmontowicz were driven into the woods a few miles from the town. There, they were shot and thrown into a mass grave. God accepted their sacrifice and the men were spared. By the power of His grace, these seemingly weak women witnessed to the strength of true love to the point of martyrdom. We take inspiration and courage from their lives. 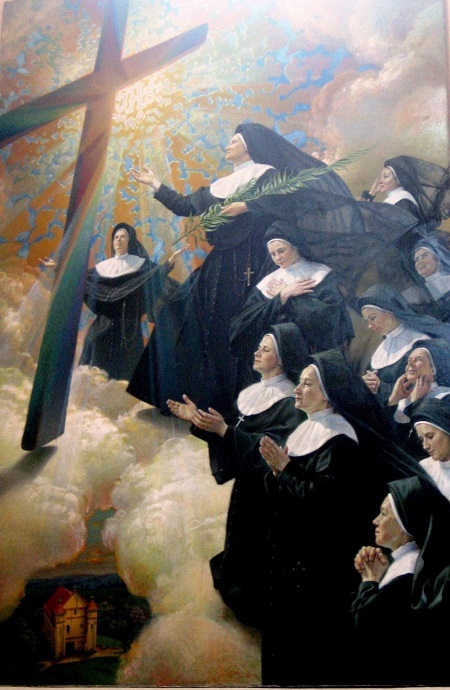 The book entitled, Eleven Prie-Dieux, is the story of the life and work of Sister Stella and her Ten Companions, martyrs of Nowogrodek. This book is available in any of our provinces.